We have now restructured our product teams and set out our goals until April 2016. We are prioritising running the live site, supporting users and - with the capacity that remains - raising the quality of those areas of GOV.UK which we under-invested in during our build phase. We will no longer be using improvement plans to prioritise our work, however we will continue to capture all ideas and requests and keep prioritised lists, as part of our internal documentation. This will include the information we gathered as part of putting together improvement plans. 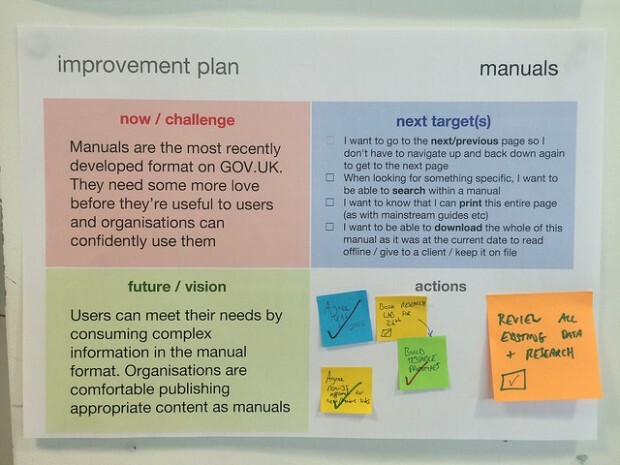 You can find more information about the new phase for GOV.UK in our series of blog posts New normal, new teams, new goals. We're trying a new way to talk about how we plan to improve GOV.UK. We're bringing together a series of improvement plans, one for each part of the site we need to iterate and improve. Last year, I came across Jimmy Janlén's improvement themes concept inspired by the Toyota improvement kata. 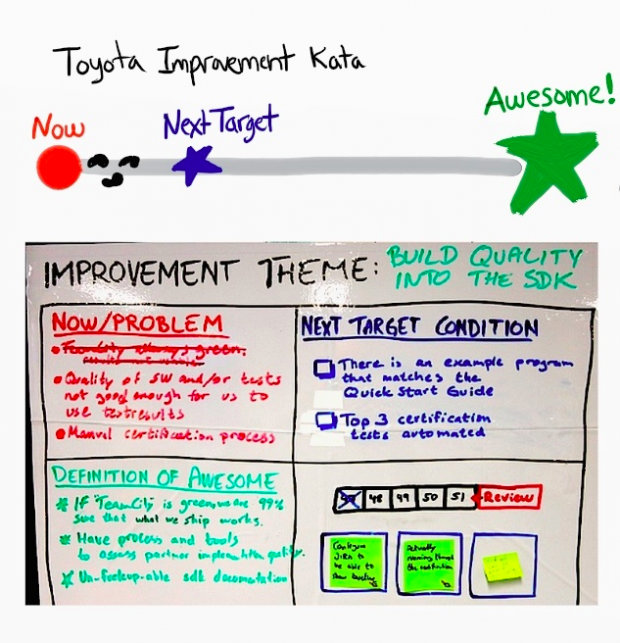 At the heart of both Toyota improvement kata and Janlén's improvement themes is a simple process; understanding a challenge and the current situation, establishing the next target condition and then iterating towards it. Here's the current theme that we're working on at the moment: improving manuals. The description of where we are (top left: "Manuals are the most recently developed format on GOV.UK. They need some more love before they’re useful to users and organisations can confidently use them") and where we want to be (bottom left: "Users can meet their needs by consuming complex information in the manual format. Organisations are comfortable publishing appropriate content as manuals") are obviously going to change over time. Even as working drafts I've found writing them and sharing them with others useful. It quickly creates a shared understanding of the current situation and where we want to end up. Shorter term, the list of next targets (top right) is a prioritised list of measurable improvements. Things we know we want to achieve next are tangible steps towards the long term vision. Here, we don't use shorthand descriptions of the improvement (eg "navigation within HMRC manuals") as that can leave different people with a different idea of the problem that needs solving. Describing the improvement from the point of view of the user (eg "I want to be able to go to the next/previous page so I don't have to navigate up and back down again to get to the next page") helps keep things clear. The list of actions (bottom right) is a rapidly changing area where we capture individual tasks that bring us closer to the next targets. These targets then act as tangible steps towards the long term vision for this area. We're trying this because we think it will be better than the previous approaches we've taken to improving GOV.UK. Historically, long backlogs of feature requests tended to only ever get longer. They also didn't make it easy for us (or you) to see the connections between those small improvements in context. Improvement plans should help with that. Now, we'll be able to share why each plan is important. This will also give you (and us) a chance to see how we're prioritising specific improvements as part of a wider theme. These plans will become something you'll be able to use to see where we're going with different parts of the product, and why. Having a clear vision and definitions of success for each area of GOV.UK also helps us to prioritise our improvement work. it also gives us a natural way to focus on one thing at a time. 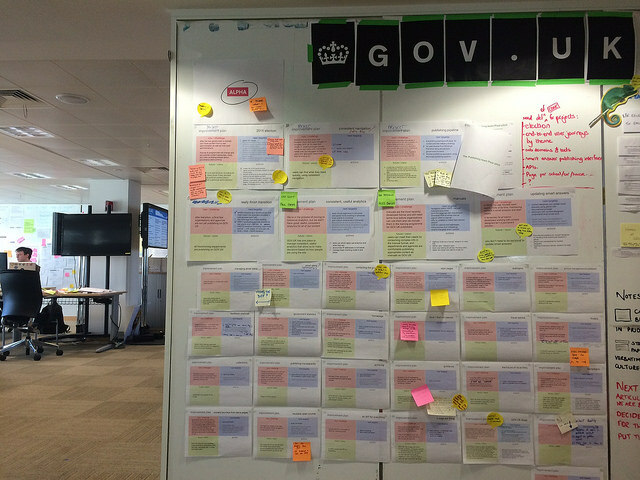 We're creating plans for lots of different parts of GOV.UK at the moment. I'm still working out the best way to share all of them publicly. Let me know if you have any ideas about the best way to do this. The core GOV.UK team are starting to make improvements to GOV.UK by focusing on one of these themes at a time. In the future, we may find we're able to tackle multiple themes at once. For now, we're starting with the simplest approach possible and learning as we go. After we've made the first few tangible improvements to manuals, we're planning to pick up the next improvement theme: user feedback and support in earnest. At that point, we'll start planning ahead for the next 3 improvement plans, and publishing them. I'll be sharing more soon. Roo Reynolds is a product manager on the GOV.UK core team.